Personalized Mini Soap Favor Decorated With Flowers - Our Personalized Mini Soap Favor Decorated With Flowers make wonderful favors for your bridal shower, wedding or any special occasion! The mini 25g Olive Oil Bar Soap is imported from Sweden. The luxurious soap has a refreshing scent that is inspired by the beauty of olive flowers and the freshness of olive leaves. This vegetable soap gently cleans your skin and adds the protecting benefits from the olive oil. Each bar soap is wrapped in your choice of 10 beautiful tissue and gorgeous flower combinations listed below. Sold individually. The Oval Label can be personalized with 3 lines, up to 14 characters per line including spaces. We can personalize the labels all the same, or email us your guests' names at sales@weddingsarefun.com and we will personalize each soap label individually. 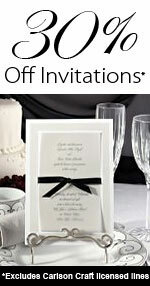 Select Color of Personalized Oval Label: White or Ivory. Measurements: 2 1/2" x 1 5/8" x 7/8"
Scented Soaps - Hugs & Kisses From Mr. and Mrs.!